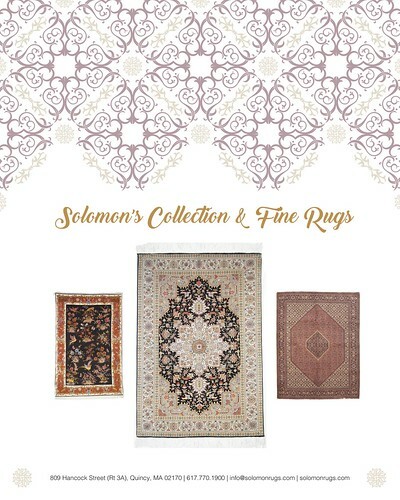 :: Sponsored by: Vermont College of Fine Arts, Brookline Arts Center, ArtSpace Maynard, Vizivel, Maud Morgan Arts Chandler Gallery, Solomon's Collection and Fine Rugs, and the Artscope Tablet Edition. This week we're presenting AS220, Gallery at Jamaica Plain Branch Public Library, and Mass Audubon's Moose Hill Wildlife Sanctuary Gallery with artist exhibits that display a wide variety of mediums and practices. There are many other interesting and exciting events and exhibitions coming up for those who want more. Numerous First Friday receptions in Boston's SoWa district have been rescheduled to tomorrow, January 12. In addition, Artscope is supporting The Museum of Russian Icons's exhibition Migration + Memory, which you can visit from now until January 28, 2018. AS220 is showcasing Margie Butler's exhibit "COUNTERBALANCE" in the Main Gallery through January 27. There will be an opening reception this Saturday, January 13, from 5:00pm - 7:00pm. Her new collection of work being shown in this exhibit ranges from mixed media collage to abstract paintings. Butler's broad use of organic and found materials combined with form and color will draw the viewer in immediately. These materials give Butler's paintings intriguing textures and bring them beyond the confines of their canvases. AS220's Main Gallery is located at 115 Empire Street in Providence, Rhode Island. AS220 offers artists opportunities to live, work, exhibit and perform in our facilities, including: four rotating gallery spaces, a performance stage, a black box theater, a print shop, a darkroom and media arts lab, a fabrication and electronics lab, a dance studio, a youth program focusing on youth under state care and in the Rhode Island juvenile detention facility, 47 affordable live/work studios for artists, and a bar and restaurant. For more information, please visit as220.org/january-gallery-openings. 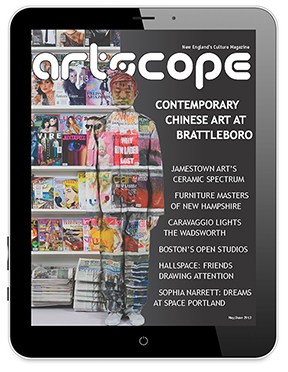 Sponsored by: Vermont College of Fine Arts, Brookline Arts Center, ArtSpace Maynard, Vizivel, Maud Morgan Arts Chandler Gallery, Solomon's Collection and Fine Rugs, and the Artscope Tablet Edition. Vermont College of Fine Arts invites anyone interested in pursuing a visual art graduate degree to visit the MFA in Visual Art winter residency from Jan. 25 - Feb. 2, 2018. You'll be able to talk with current students, meet our faculty and visiting artists (including Artist-in-Residence Tariku Shiferaw) and see what's made VCFA's graduate, low-residency MFA in Visual Art program the best in the country for more than 25 years. Call 866-934-8232, x 8636 or learn more here. ArtSpace Maynard is seeking proposals for ArtSpace Outdoors 2018. On view in the Gallery at the Jamaica Plain Branch Public Library is "Liliana Marquez: RePOPART." Liliana Marquez was born and raised in Caracas, Venezuela and has a background in graphic design. For the artist, RePOPART is about attitude and her interest in mass production and reuse. Her artistic devotion to reclamation produces an interesting and bold body of abstract work. There will be a public reception tonight, January 11, from 5:30pm - 7:30pm. The exhibit can be viewed through February 25th and is proudly sponsored by The Friends of the Jamaica Plain Branch Library. The library is located at 30 South Street in Jamaica Plain, Massachusetts. Monday - Wednesday 10:00am - 6:00pm, Thursday 12:00pm - 8:00pm, and Friday - Saturday 9:00am - 5:00pm. For more information, please visit friendsjplibrary.org/exhibitions/2018/1/2. Through February 5th, Mass Audubon's Moose Hill Wildlife Sanctuary's Gallery is showing "Seeing Through the Trees". The distinctive work by the three exhibiting artists Art Donahue, Helen Lozoraitis, and Lindsey Nygaard, explores the endless beauty of nature and the habitats within. Art Donahue brings technology and the aesthetics of photography together showing the viewer his perspective on naturalistic landscapes. Helen Lozoraitis photographs and creates mixed media from the real world and fictional landscapes. Lindsey Nygaard's oil paintings reveal a simple yet stunning complex image of the natural world. "Seeing Through the Trees" reveals the hidden beauty of nature that often goes unnoticed in the modern era. Each piece shows the viewer those elusive parts of the natural world; revealing what they might see if they looked deeper into the trees. Mass Audubon's Moose Hill is located at 293 Moose Hill Parkway in Sharon, MA and is open daily from 10:00am - 4:00pm. For more information, please visit massaudubon.org/get-outdoors/wildlife-sanctuaries/moose-hill/exhibits/seeing-through-the-trees.